"The Only Bed that Goes to Work When You Go to Sleep"
LAS VEGAS--(BUSINESS WIRE)--Jan. 3, 2017-- Today at CES Unveiled in Las Vegas, Sleep Number will introduce the Sleep Number 360™ smart bed, one of the most significant innovations in the company's 30-year history. Powered by SleepIQ® technology – the latest in biometric sleep tracking – the Sleep Number 360 smart bed intuitively senses and automatically adjusts comfort to keep both partners sleeping soundly all night. The Sleep Number 360 smart bed will forever transform the way people sleep, and improve wellbeing through better quality sleep. 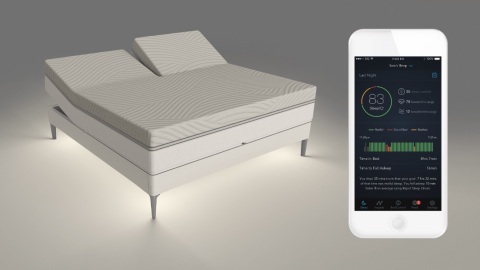 "Today we are excited to unveil the future of sleep: the Sleep Number 360 smart bed, a revolutionary product that redefines what people should expect from their bed," said Shelly Ibach, Select Comfort president and chief executive officer. "A great night of quality sleep is essential to a healthy mind, body and soul. Consumers love that the Sleep Number 360 smart bed automatically adjusts during the night to ensure you have your best sleep ever." The Sleep Number 360 smart bed was named the CES Innovation Awards "Best of Innovation" Honoree in the Home Appliances category, an award given to only the highest-rated product or technology in the category. The Sleep Number 360 smart bed also was named an Honoree in both the Smart Home category and Embedded Technologies category. The annual CES Innovation Awards celebrate outstanding product design and engineering in brand-new consumer technology products. Self-adjusting comfort throughout the night. As sleep positions change during the night, each partner can sleep comfortably. ResponsiveAir™ technology adjusts the bed's comfort in real time via the two air chambers inside the mattress – gently contouring to each partner's side, back or stomach profiles. Automatic snore detection and adjustment. Sensing SleepIQ® biometrics, the adjustable base automatically adjusts to each sleeper's ideal position throughout the night. For example, if someone is snoring on their back, the base automatically raises the snorers' head seven degrees to help temporarily relieve the symptoms of common, mild snoring in otherwise healthy adults. Foot-warming to fall asleep faster. Research shows that people fall asleep faster when their feet are warmed. Through SleepIQ technology, the Sleep Number 360 smart bed knows a sleepers' bedtime routine and warms the foot of the bed automatically with Rapid Sleep Onset™ technology. Smart alarm feature awakens at the optimal moment. The newest advancement of SleepIQ technology understands a sleeper's bedtime routine, and knows when they would like to wake up. For example, an alarm will sound when they are in their lightest stage of sleep during their desired wake-up time window. Sleep Number will phase in the new beds and bases in all Sleep Number® stores and online, beginning in the first half of 2017. The Sleep Number 360 smart beds and bases will be priced similar to Sleep Number's current mattresses and adjustable bases. Nearly 30 years ago, Sleep Number transformed the mattress industry with the idea that ‘one size does not fit all' when it comes to sleep. Today, the company is the leader in sleep innovation and ranked "Highest in Customer Satisfaction with Mattresses" by J.D. Power in 2015 and 2016. As the pioneer in biometric sleep tracking and adjustability, Sleep Number is proving the connection between quality sleep and health and wellbeing. Dedicated to individualizing sleep experiences, the company's 3,600 employees are improving lives with innovative sleep solutions. To find better quality sleep visit one of the 530 Sleep Number® stores located in 49 states or SleepNumber.com.